Rev your energy levels up a gear with a book of daredevil fun. Quizzes, puzzles, rescues, games, stickers and much more! Take the action to the max! With Venjix’s evil droid forces on the loose, there’s no time for relaxation. The Power Rangers need you to hit the gas, and drive evil from the universe! Packed with wordsearches, code breakers, colouring, mazes and all kinds of exciting missions, this book whisks you into the high-octane world of the RPM Power Rangers. Need stationery to complete your puzzles? No worries! 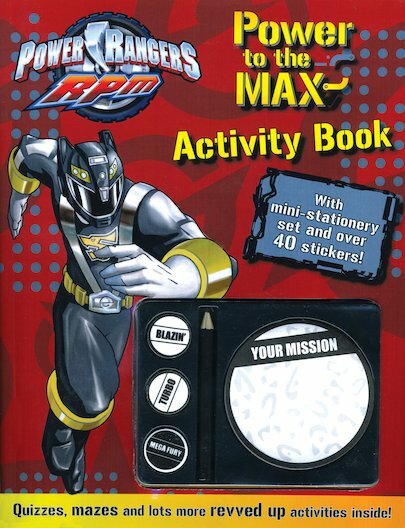 The book includes a mini stationery set with three erasers, a pencil and “Your Mission” post-it notes, plus over forty cool RPM stickers!